Diabetes & Me - How to live with it? My name is Karin Kanc Hanzel. I am a medical doctor, specialised in internal medicine and a PhD in diabetology and Certified Integrative Psychotherapist (IIPA). I wish to help people with diabetes, who face everyday dilemmas as to how to cope with their condition and lead a quality life. Living with diabetes is quite challenging – there is no time to rest; the disease often surprises the patient with an unexpected hypoglycaemia or inexplicably high blood glucose levels. It is you, who can do the most to improve your condition. I will be very happy, if you choose me as your counsellor on the long and winding journey towards managing diabetes. NEW! The book of recipes! Our dietician and myself, we have just published a book of recipes with vivid original photos and menues that naturally follow the seasons. 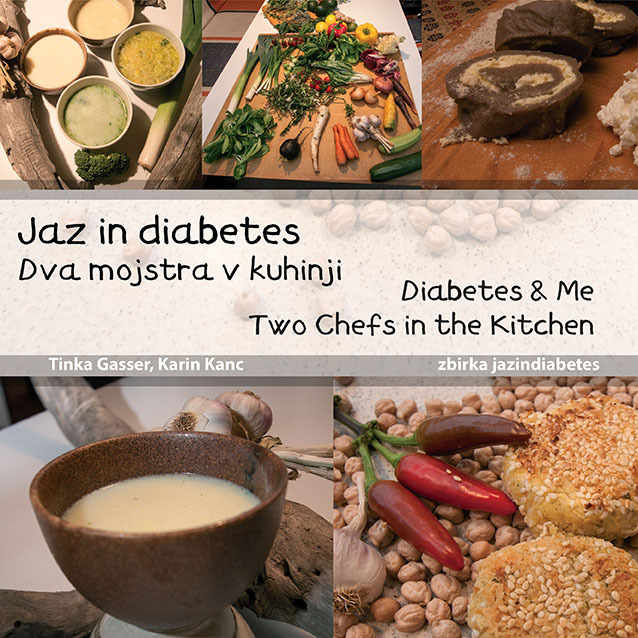 Recipes are based on typical Slovenian dishes with healthier ingredients, available locally and are suitable for everyone that wishes to eat healthy, including people with diabetes and their families. Detailed calculations of nutrients are added. The dogma of five meals is challenged by recommended four meals only, and the fifth meal being substituted by a little bit of hunger! Look through a few pages of this bilingual book. The price is 20€, only (if fetched directly from our office) or by ordering it here or over phone +38614254378 (postage added to the original price). As diabetologist I soon realized that only my medical knowledge was not enough to treat people with diabetes the way I felt it was needed-also from a psychosocial perspective. I have first experienced the beneficial psychological approach during my studies at the diabetes department of the Vrije Universiteit in Amsterdam back in 1994. I am co-organiser of the International DiaMind Meeting (Diabetes & Mind). The seventh Meeting was taking place on April 5, 2018. Welcome to the next one in 2019.